Nikon D7200, 12-24mm f/4G lens @12mm f/8, aperture priority. 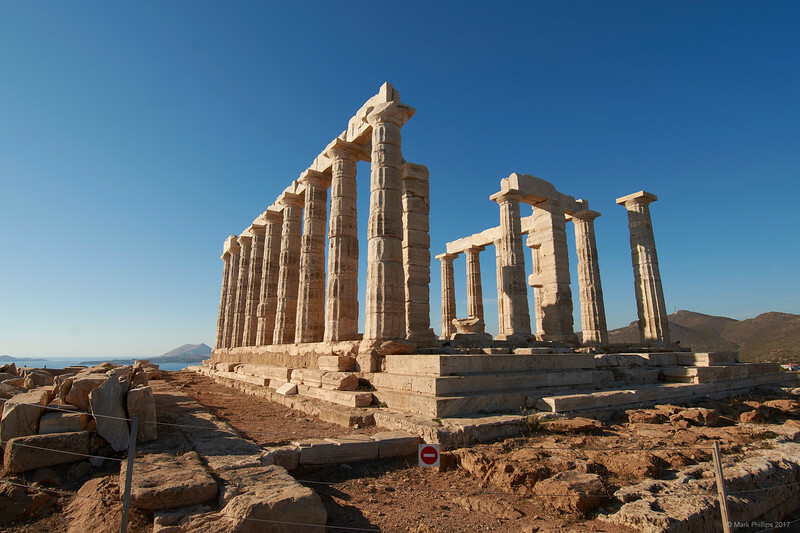 "Archaeological evidence indicates that Sounion was a sacred area as far back as the Bronze Age, but the temple visible in our day was built in the middle of the 5th century BCE (between 444 and 440 BCE). It was part of the ambitious building project initiated by Perikles, which included other renown temples such as the Parthenon and the Hephaisteion. Given the similariteis of the Temple of Poseidon to the Hephaisteion and the temple of Nemesis in Rhamnous, many historians have concluded that they were designed by the same architect. One particularly unifying feature of all three temples is the fact that the columns of the porch were aligned with the third column of the peristyle." back to Athens & Sounion, Greece, 2017.10.19 index.